In the development of multimodal interfaces, this journal offers a standard reference for multidisciplinary work. As implied by the word Interfaces rather than Interactions in the title, the journal seeks to illustrate verifiable realisations over purely theoretical musings. 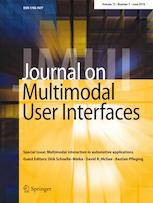 The journal focuses on multimodal interfaces developed with an emphasis on user-centric design. Thus, usability and architectural considerations are also key targets.